Publishers helped advertisers drive in excess of €1billion in sales revenue for biggest month ever. Awin tracked in excess of €1billion in sales revenue generated by advertisers on our network in November, making it the biggest month yet. As predicted in our Golden Quarter whitepaper, November looks set to reign supreme, driven by the seasonal spikes coalescing for China’s Singles’ Day (11th November), Australia’s Click Frenzy (13th November) and the Black Friday/Cyber weekend (23rd – 27th November). Black Friday is a ten-day event. With growth between 2016 and 2018 averaging between 40 and 50% across the period preceding Black Friday along with the subsequent Saturday and Sunday, it’s clear brands are starting to block off the second half of November as a general promotional period. The only other day to hit 50% growth was Singles’ Day. Cyber Monday continues to diminish in importance. The traditional peak trading day for a number of years in both Europe and North America, the Monday bookended with Black Friday was overshadowed, pulling in roughly half the revenue and sales as Black Friday. For the first time Awin US tracked more on Black Friday. Black Friday is becoming more tactical. While the big day is associated with blunt, hard-headed discounting, those brands who are focusing on customer quality are seeing positive bumps in new customers on Black Friday. Price comparison and cashback showed the biggest proportional uplifts (44% and 39% respectively) in new customers when studying a handful of retail brands on the network. Mobile continues to make strides. While no market hit the magic 50% figure, the UK saw handset sales exceed desktop transactions by around three percentage points. Sweden wasn’t far behind, but the outlier performance of 2018 was Poland where mobile sales almost trebled across the year. The past 12-months have seen the rapid ascendancy of consumers embracing mobile ecommerce there. The hidden threats. With Apple’s launch of a new browser designed to curb third-party cookies tracking customer journeys how has this played out in Awin’s numbers? It is difficult to know with conversions improving across the board during November’s peak. Instead the impact may become clearer over time with both publishers and networks looking to recoup lost revenue from those advertisers with legacy tracking. Consumers increasingly turning to incentives. Black Friday and the wider weekend provide a natural environment for cashback, loyalty and coupon sites to succeed, and the proportion of sales tracked through these publishers increased again in 2018. In all but two markets vouchers won out with the largest share of revenue, with cashback the largest in the US and Sweden. Consumers spending more… or less? Barclaycard reported that UK shoppers were buying more but spending less on average across Black Friday. According to Awin’s numbers, the picture varied by sector with the struggling department store sector taking a hit this year but electronics, health and beauty and clothing all seeing a positive bump in the average basket. The Black Friday elephant marches on. 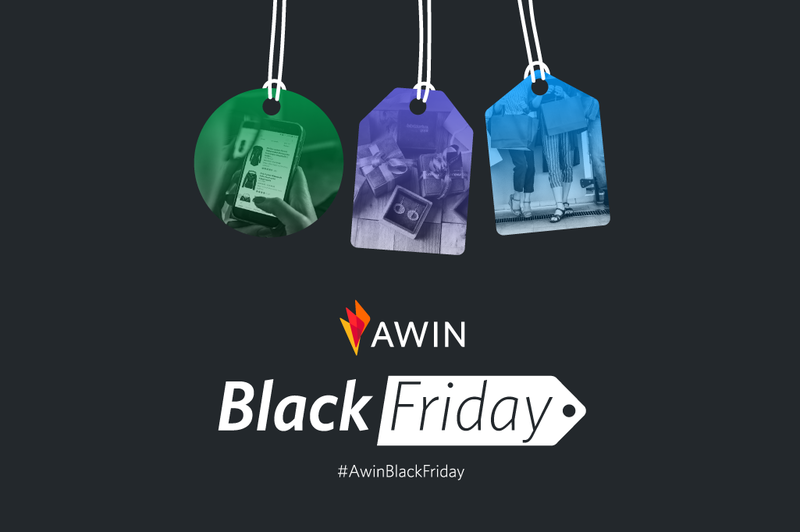 Awin’s performance across the 24-hours of Black Friday broadly reflects the outline of an elephant and 2018 was no different. The real detail lies behind the hour-by-hour shifts and patterns that emerge of shoppers interacting with a wide variety of affiliate activity buying from a broad cross-section of products and retailers. This showcases the strength of the affiliate channel.